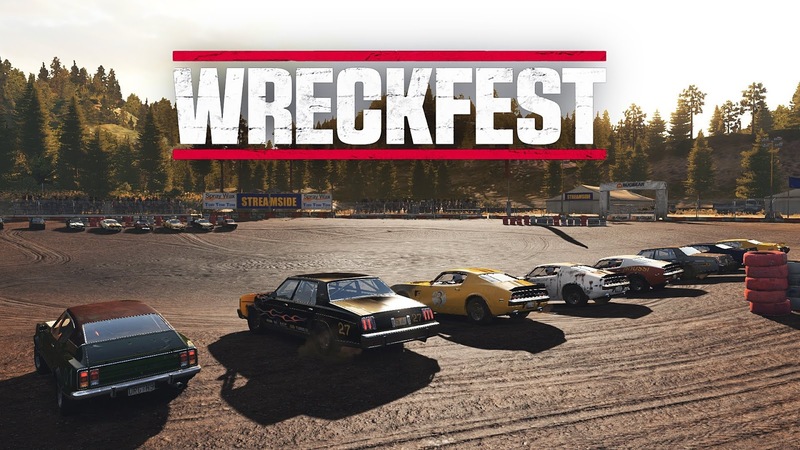 Wreckfest is suppose to be a next-gen demolition derby game for PC with lots of old cars and lots of tracks. Everything is also suppose to ooze with style, with the cars and tracks very detailed and realistic. The only exception is cars and tracks that are still WIP. It currently contains several events, each with several moes th play in. Cars can be unlocked by buying them with credits, that are earned by winning or loosing multiplayer or singleplayer events. You get 5000 credits when first starting up the game, enough to get a new car, some better parts for your car, and/or the tractor to farm credits with. Once a car is unlocked, you can customize several parts of the car, by buying parts in the market with credits. These parts degrade overtime, which decreases performance, so you will have to replace parts eventually. This isn't much of a problem, because credits are kind of easy to get in the game, especially once you unlock the lawnmower, which allows you to farm credits easily(not telling how). The damage physics are really good, with every part of the car able to be broken or deformed. If your car takes enough damage, it will explode and you will lose the event you are playing in. This can happen in all gamemodes. The only time you do not pose when your car explodes is when you are playing a deathmatch, which is where you have to get the most takedowns possible in a short amount of time. Regular demolition derbies are like the classic, requiring that you are the last man standing. Banger races are just as you expect, races. You can also take down players in this mode. Team races are where you earn points for your team by staying in a good place in races. Team demolition derbies are where you have to help your team get the most takedowns before the time runs out. The winning team is determined by the amount of points that a team has. The graphics are really well done, improving or deproving depending on the graphics settings. However, a high-end gaming PC is required to experience the true graphics quality of the game, and a mid-range PC is required to play the game on minimal settings. So people playing on toaster PCs are left out sadly. The price for it is perfectly reasonable, as the game is still in early alpha. The game is bought in "plans", and no, you don't need to pay a subscription for it. However, you will have to pay more money for a batter plan, which contains better goodies, including wallpapers, a custom car skin, and more! Overall, I give this game a 7/10. This is because of the good graphics, physics engine, and gameplay. The score is only a 7 though because of the System Requirements being very high to experience the game in the best graphics, having to farm credits to unlock more parts and vehicles, and the difficulty of the game, especially when you start out with the worst car. It's a very nice review. Thanks for showcasing. Ok, I will try to add in pictures into the post. Sadly, I don't know how to add in pictures from a website. when on a website.. if in the OLD IE brower right click and do: properties. another you can add images into reviews like this is just: google wreckfest. I googled the game and found a CRAP ton of images I was able to choose from. and put that into into the img brackets. or.. click the IMG icon in the BB CODES above. where you type at in this comment box. OK, thanks for telling me how to insert images. I was trying to take the images directly from the Steam Store page, so that they are truly official, and not outdated. ya, its hard to pull pics off of the steampage due to how they embed there pics. Its easier to search on bing or google. its usuhally not too hard to do it that way and find updated and relevant pics.